Australian master brewer Dr. Charles ‘Chuck’ Hahn first established the Hahn Brewery in the suburb of Camperdown in Sydney, in 1988. Though he continues to produce beer of the highest quality to this day, his original creations, like Hahn Premium Light, still stand up. 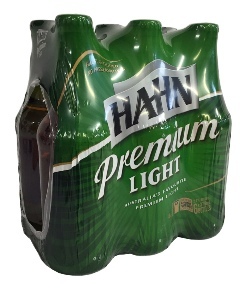 Hahn Premium Light pours a clear gold with a bright foamy head. The aroma has a hint of malt, and the taste itself is subtly hoppy with grainy notes. Its low sugar, and alcoholic content means it’s an ideal choice for easy-going, post-work lager. Love this beer, spent 2 years drinking every day in Sydney. If only it didn't cost so much, I'd set up a regulate order. Expat living in the UK, waited for over 5 years for Sanza to get this bad boy in and ordered a few 6 packs a little while ago and will be ordering for Xmas. Hopefully you will get more stock in and keep stocking it!! I will def buy it from you!! Finally Sanza has this awesome beer in stock!! It's great for people that like having a beer, without getting too tipsy. It's only 2.7%. It has a clean, crisp taste, without that horrible 'liquid rubber' taste, that most low/no alcohol beers have. There's no beer like it in the UK. Nice work Sanza! !